Since Office 365 provides the larger email quotas, it’s better to move the email messages and other data from Outlook to Office 365 account. This will help you access all your emails from anywhere at any time, no matter what device you’re using. I’ve seen many Outlook users asking how to import PST to Office 365 account. In this article, we’ll discuss the benefits of Office 365, and why one should switch to this cloud-based service. Also, I’ll help you learn how to upload PST to Office 365 by using a professional solution. Many Office users still don’t know what Microsoft Office 365 is. They often underrate or overlook the real benefit of Office 365. If you think it’s just a classic Office product, then you’re wrong. Office 365 not only provides Word, Excel, PowerPoint, etc. from the cloud but also some new additional features. The primary role of Office 365 is to create an essential and strategic direction within the enterprise. If you’re planning to subscribe to a cloud service, you should definitely consider Office 365. Microsoft Office 365 is a complete cloud-based productivity platform for business enterprises. It smartly empowers everyone to be creative and work together securely. It ain’t just a browser-based version of the Office suite. Although it contains all the familiar Office components, it provides services like Skype for Business, Exchange Online, and SharePoint Online. Additionally, it offers security features, social networks, data analyses, project work, real-time communication, and much more. Widely Accessible: Being a cloud-based service, Office 365 allows users to access the data from anywhere on any device at any time. Also, the data is being regularly backed up by using the advanced security measures. Easy Setup and Management: It’s very easy to set up users with Office 365, and also to manage. You can start installing the tools right after you complete the setup process. You can do it by yourself or take help of your IT partner. Excellent Collaboration: While using Office 365, you can easily edit the files, manage the projects remotely, communicate with your staff from anywhere, etc. Simplified Migration: It’s very easy to migrate to Office 365, no matters which storage tools you’re using. Since Office 365 supports regular updates, you don’t need to migrate your data again. Data Loss Prevention: There’s nothing more valuable than data and documents to a company. Losing any crucial information can be disastrous sometimes. The data protection and backup services offered by Office 365 help you avoid such loss. Being a world leader in cloud security and privacy, Microsoft assures you that your data is always safe in Office 365. Always Up-to-date: If you switch to Office 365, you don’t need to wait a couple of years for the next product release of Microsoft. Instead, you’ll get the instant updates and bug fixes as soon as they’re ready. Switch to Office 365. Why? Today many companies keep using outdated technology, and there’s a number of reasons for that. They presume that their current platforms are good enough, and the staff is now familiar with the work style. And the most important reason is that migrating all the data over to the new platform might be a cumbersome task. But remember, employees who use modern technology are more creative, productive, and satisfied at work. So if your business hasn’t switched to a cloud service, do it now. For small to medium-sized businesses, it’s very important to focus on business productivity. By using Microsoft Office 365, you can achieve this goal with a familiar Microsoft experience, and excellent features at a low cost. If your organization has switched to Office 365, you need to migrate your business data to this cloud-based service. Let’s talk about the crucial emails and other mailbox data stored in the classic Outlook application. How would you migrate email to Office 365 account? Sometimes this might be a challenge if you don’t have the sound knowledge. But don’t worry. I’ll help you with this. There are two ways by which you can import PST to Office 365 account: either you can try an easy DIY trick or you can use a professional solution. First, let’s start with the DIY trick that requires no 3rd party tool. You must be familiar with the Import & Export feature of Microsoft Outlook. You’re going to use this feature here. Go to the Control Panel and click Mail (Microsoft Outlook 2016) (32-bit). On the Mail Setup dialog box, click the Show Profiles… button. On the Mail dialog box, click the drag-down arrow under Always use this profile option. Select Outlook, and click Apply > OK.
Now launch Microsoft Outlook on your system. On the taskbar, click the File tab > Open & Export > Import/Export. On the Import and Export Wizard, select Export to a file. Click Next to continue the process. On the Export to a File dialog box, select Outlook Data File (.pst). Click Next to continue the process. On the Export Outlook Data File dialog box, you can either select the entire PST file or any specific mailbox folder. Click Next to continue the process. Click the Browse… button to define a location where you want to create this new PST file. Name this file and click OK to save it. Now select the option whether you want to avoid duplicate items or not. Finally, click Finish. Now close Microsoft Outlook. Again, go back to the Control Panel and click Mail Microsoft Outlook 2016 (32-bit). On the Mail Setup dialog box, click the Show Profiles… button. On the Mail dialog box, click the drag-down arrow under Always use this profile option. Select Outlook 365 Email, and click Apply > OK.
First, launch Microsoft Outlook on your system. On the taskbar, click the File tab > Open & Export > Import/Export. On the Import and Export Wizard, select Import from another program or file. Click Next to continue the process. On the Import a File dialog box, select Outlook Data File (.pst). Click Next to continue the process. On the Import Outlook Data File dialog box, click the Browse… button to locate the PST file you want to import. Select the PST file, and click Open. Now select the option Do not import duplicates, and click Next to continue the process. Finally, click Finish. You can take help of this video tutorial. By using the above DIY trick, you can effectively import PST to Office 365 account. However, there’s a major drawback of this manual trick. If you need to upload a large number of PST files, it’ll take enough time. Ain’t it annoying to upload multiple PST files to Office 365 one by one? So if you’re looking for an instant and effortless way, you should look for a professional solution to import PST to Office 365. Why choose Shoviv PST Recovery Tool? Shoviv is one of the fastest growing and emerging IT companies in the field of software development. It provides a wide range of products and services smartly designed for business productivity. When it comes to email conversion or email migration, Shoviv is the name you should always prefer. The PST Recovery tool provided by Shoviv Software is a multi-functional utility. It can not only repair PST file but also export it to different platforms like Live Exchange, Novell GroupWise, Lotus Domino and Office 365. So if you’re looking for a way to import PST to Office 365, you should definitely opt this Outlook Recovery solution. First, launch Shoviv PST Recovery tool on your system. Now add PST files which you want to upload to Office 365 account. Simply click the Add PST Files button on the taskbar and select the PST files. You can select any number of PST files at a time. All the selected PST files will be shown in the tree-structure. Right-click there and select Export all Files to Office 365 option. In this way, you can successfully import PST to Office 365 by using the smart PST Recovery tool. In this article, we’ve discussed Office 365 and why we should use this cloud-based service. Also, we’ve talked about the benefits of Office 365. The article explained an easy DIY trick to import PST to Office 365. And if you can’t use the manual trick, you should switch to a professional solution. 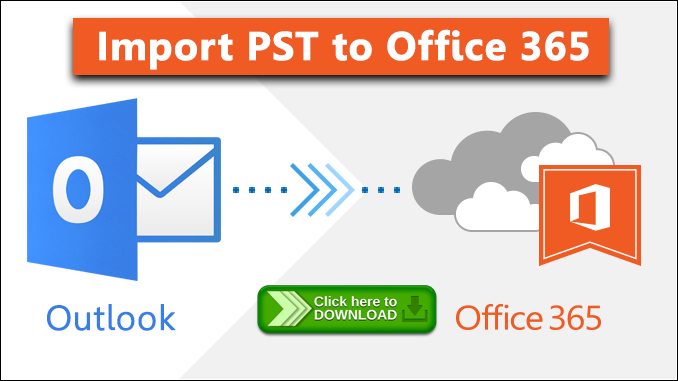 The PST Recovery tool provided by Shoviv Software can help you migrate email to Office 365 account in the most effortless way.